I'm not going to lie. I love it. Now I just have to put together an outfit to go with it. Making this necklace was so simple. The hardest part about it was tying knots in the correct places to make it all balanced. And I just realized that when I took the photo above, the necklace was crooked. It's not crooked in real life. 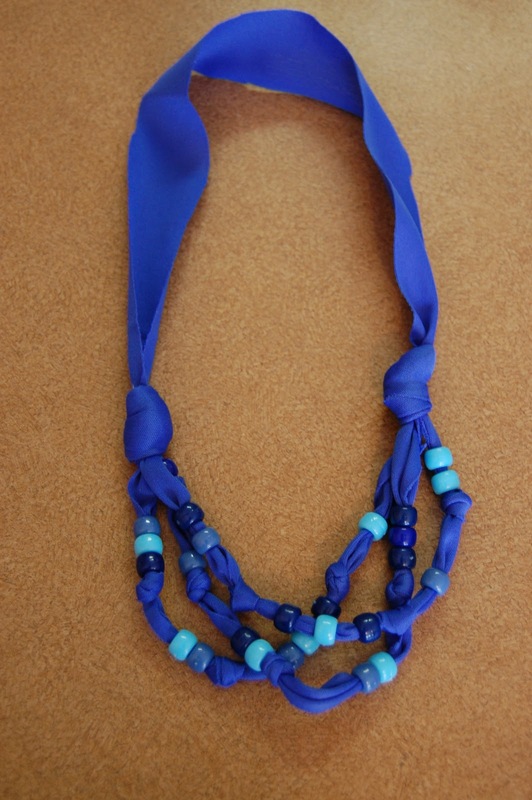 I wanted to do something similar to the Helmut Lang necklace I came across on the blog, P.S. I made this. I don't have leather scraps but I do have tons and tons of blue fabric leftover from my wedding decorations. I'm always looking for new ways to use my blue fabric. These are the supplies I used to make the necklace. Thread three separate 18 x 1.5 inch strands of fabric with beads in random order. Knot them in random places. Safety-pin the three beaded fabric strands together at one end and knot them together. Repeat on the other end of the three fabric strands. After all the pieces are knotted together and balanced just how you want them, losen the knots from the unbeaded strand, put a small dab of hot glue inside the knots, and tightened them back up (to keep it from coming untied). Finally trim the ends outside of the knots. Tah Dah!!! Fun. Note: the fabric I used was polyester or something similar so it does not unravel easily. I didn't hem the fabric, I used it with raw edges.